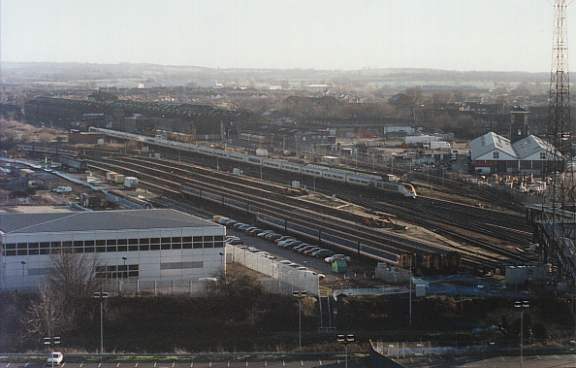 This view is slightly further round to the left than the last (98b) and shows the new Ashford Integrated Signalling Centre on the left, stabling centre (where the new line will cut through) and a Eurostar arriving from Paris on the main line. Behind the Eurostar is what remains of the old Ashford Railway Works, main workshop for the old South Eastern and Chatham Railway. Now just a collection of industrial units, a listed clock tower, and the railway Civil Engineers dept.